AboutAran.com: Some Árainn and Claddagh connections. Some Árainn and Claddagh connections. As we recently passed "The swamp" sports fields at the Claddagh it occurred to us that the stomach high shine on the boundary wall is not as polished as it was in days of old. Forty years ago, leaning over this wall while watching young men at play was a great pastime for many of the elderly residents of this part of Galway. A good game of football or hurling was expected, and a good row was an extra bonus. 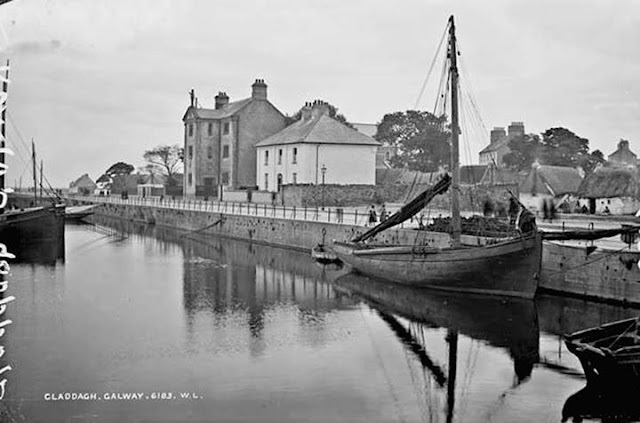 Claddagh over a hundred years ago. The wall to the right was the wall that bounded the city dump,later a football field. 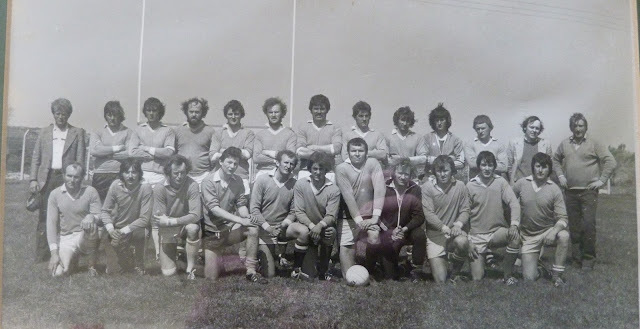 We were also reminded of a day back in 1976 when the Aran team came to play a football game here in our first year as a registered football club. The islands had produced many fine teams before but this was the first year we entered a competition. The passing of the years has dimmed the memory of that day so that only small incidents from the match still remain. We were playing against a great football parish, Killannin, we won, but only two incidents from the match itself still remain. The winning point being scored by a fisherman from the Connacht Ranger and a spectacular volley ball style goal scored by the recently appointed woodwork teacher at the local secondary school. When the football boots have been put away for ever, it's the special friendships made with your team-mates and the battles with your opponents that remain uppermost in the memory. Trophies and medals mean very little as the years pass by. On reflection, that last sentence sounds like something a man with a mighty bare trophy cabinet might say but so be it. As is often the case, it's something trivial that remains and the main memory from that day is a great report we later got from one of our mentors as to the conversation he overheard three old Claddagh men engage in as the game progressed. Our mentor was the late Gairmscoil headmaster,Caomhán Ó Goill (Kevin Gill) and the game was to him much less entertaining than the remarks from the three old men. In fairness to Caomhán, when it came to a choice between concentrating on a junior football match or three old men making comments, it was no contest. There had been two men in their 70s or 80s leaning over the wall as the game started. Shortly after, they were joined by another old man who asked them who were playing. To the reply of Killannin and Aran he expressed shock and Caomhán, like all Aran men could imitate the accent of the old Claddagh men perfectly.
" Aaaaran, are ya serious ?" The other two men repeated the same two teams to which the third man again expressed shock. "Aaaaran, ya mean the Aaaaran islands? " At this stage the two men were beginning to get annoyed at having to repeat themselves but they once again said "Yea yea, Aran and Killanin. "Honest to God, the Aaaaran islands playing football, jays I thought the only thing they were good for up there was kitchin herrins (catching herrings)"
In that first year it was not unusual for teams to take a football team from the islands lightly and this was to our great advantage. By the time many teams realised that the Aran men could play football, we had the game won. The "swamp" was a new ground for many of our players although some had played there when attending school in Galway. For our oldest and most experienced player, Mikey Hernon from Cill Muirbhigh, the "Swamp" was like a home ground as he had moved to Galway as a fifteen year old boy when doing his apprenticeship as a telephone engineer and had attended the nearby Technical school. Indeed, our manager, coach and main driving force was Mikey's brother Peadar. The Aran islands and Claddagh have a long shared history as both communities looked to the sea for survival. 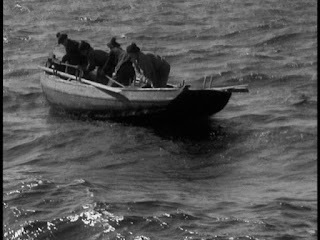 In days gone by there had even been a few clashes over fishing rights and in the 1850s the Aran crew of a boat owned by the Protestant rector of Arran, Alexander Synge, had been attacked near Ceann Boirne (Black Head), when only the production of a gun and the cutting of the nets had avoided serious injury. Eventually this dispute had been sorted and Claddagh boats were a regular sight taking shelter in Cill Éinne bay. The shark hunting scenes in Robert Flaherty's film Man of Aran will be familiar to most readers. 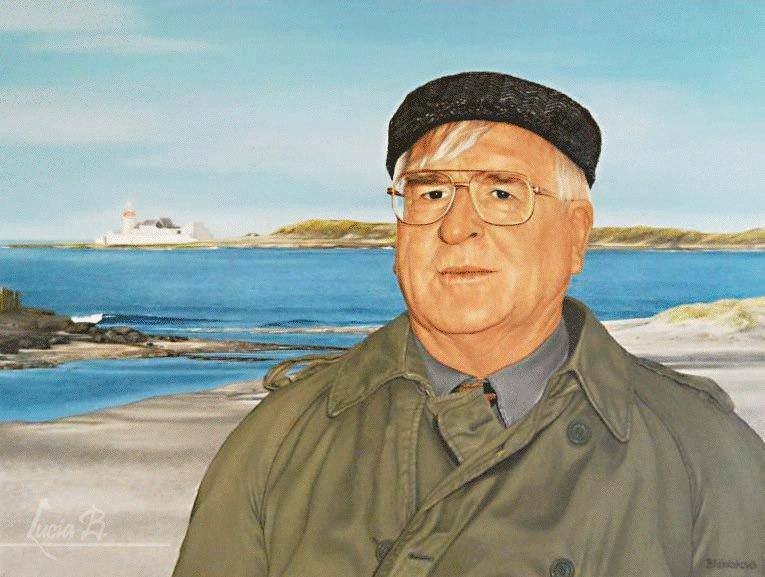 It's worth noting that the skill had died out on the islands and it was from a dying Claddagh man that Pat Mullen learned the secrets of the best way to harpoon these huge but harmless fish. 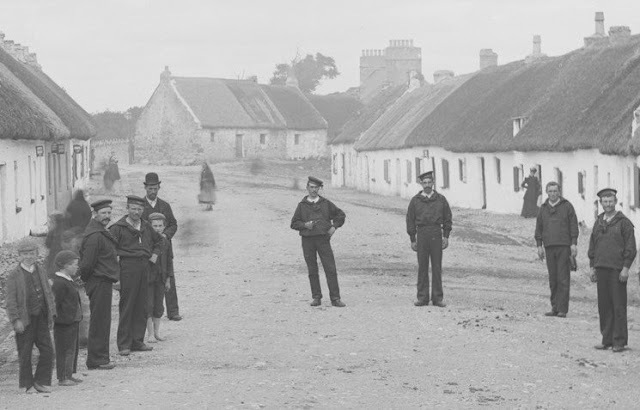 While it is often reported that the Claddagh people never married outside their own circle, this is probably overstated and many an Aran boy or girl was to marry into the fishing village. 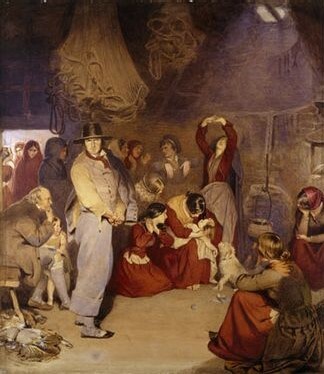 One of the most heartbreaking Irish paintings of all time is Frederick Burtons depiction of "The Aran fisherman's drowned child", painted almost certainly in the Claddagh in 1841. It seems reasonable to assume that this Aran man had married into the village. "The Aran fisherman's drowned child" (1841) painted by Frederick Burton (1816-1900) N. Gallery Ireland. What intrigued Caomhán was finding out which team the Claddagh men would throw their support behind. Born and reared where the sweet waters of the river Corrib meet the salty Atlantic, would they support the Killannin men who hailed from near the shores of the lake or would they get behind the men from the islands?. His answer was not long in coming as the newcomer let loose a roar that could be heard in Eyre Square. Caomhán enjoyed this and got an even greater kick out of the follow up roar. "Aaah for flip sake Aaaaran, will ye get stuck into them"
For the benefit of readers not familiar with the West of Ireland , we should explain what "getting stuck in " means. This is an exhortation to behave in a manner that lies somewhere between common assault and G.B. Harm. However, there is an even more blood thirsty roar which was often heard at Junior B hurling matches. The man roaring was usually an elderly ex player of limited ability, who had a reputation for removing almost as many teeth, in his own playing days, as the local dentist. In a roar that started out very low in the belly, he could be heard all around the ground as he roared "TIMBER". This was an exhortation for behavior that lies somewhere between G.B.H. and manslaughter. As both the Aran and Killannin teams were noted for playing a sporting game, the hoped for "free for all" was not to be. While both teams were well capable of finishing a good row, neither was inclined to start one. The world has changed a lot in forty years and that old generation of Galway men are long gone. In 1976 it's possible that the three old men might have once served in the Royal navy during one or both of the two World wars. Claddagh has a long history of providing fine sailors to the navy and there was probably not a British navy base in the world where Claddagh men hadn't kicked a soccer ball. In days gone by, Claddagh men played soccer, rugby and hurling. The Aran writer Brendán Ó hEithir mentions in his book 'Over the Bar' that in the 40s the only foreign game in Galway town was Gaelic football. This game was introduced by players from the football strongholds who moved to the expanding city. Galway is almost a home town to Aran islanders as they have traditionally done all their business there and were often marooned there for days when bad weather cut off the islands. 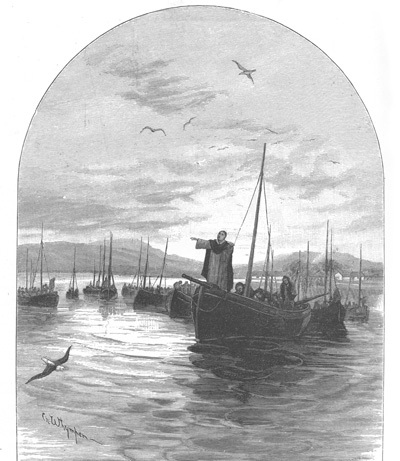 The fishermen on our team were particularly at home in Galway as all fish was landed there until the new harbour was opened a few years later at Ros 'a Mhíl. The fishing was good in the 70s and the confidence from this filtered through to the football and made Aran a formidable force in their first years of competition. 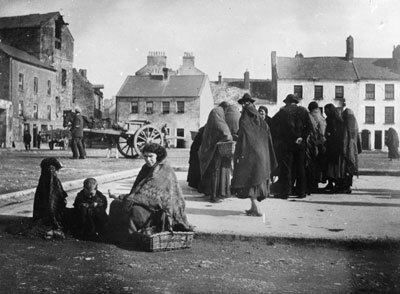 Galway people then had a relaxed way of looking at life and we can recall some of the figures of speech and conversation traits from those times. One of the most entertaining was a tendency sometimes to start a conversation with the words "I hope you don't mind me saying". This was very popular with some of the older women and of course nothing could be further from the truth. They really didn't care whether you minded or not, they were going to say it anyway. In fact the more they though you minded the more they enjoyed saying it. These few words put you on guard that you were going to "mind" a little, what was coming next. You knew you were going to "mind" a lot if the word "really" was added, as in "I really hope you don't mind me saying". These old women were great to feign sincerity and they had an amazing ability to half close their eyes as they said it. At the same time they would nod their head up and down and shake it from side to side, alternatively and at great speed in order to reinforce this feigned sincerity. All that generation are long gone now but not forgotten. The tide around Claddagh has come and gone many a time since 1976 and the Corrib has emptied billions of gallons of fresh water into the bay. Some of the men and boys, on both teams, who played that day are dead and gone and some are far from home. Greetings to all those who ever played in "The Swamp", and may be reading this. Like the lines in the old song, we remember those days. Gone alas like our youth too soon. P.S. Forty years is a long time so we may have a couple of things incorrect. Alas, Caomhán is no longer around to consult but it's possible that the word the old Claddagh man used when he advised the Aran lads to "get stuck in" was not "flip". However, we are fairly sure that it started with F.